Florida is home to 67 counties and over 400 cities, towns and villages—each with a unique local character. Looking for proof? Look no further than the distinct holiday celebrations hosted by communities across the Sunshine State. 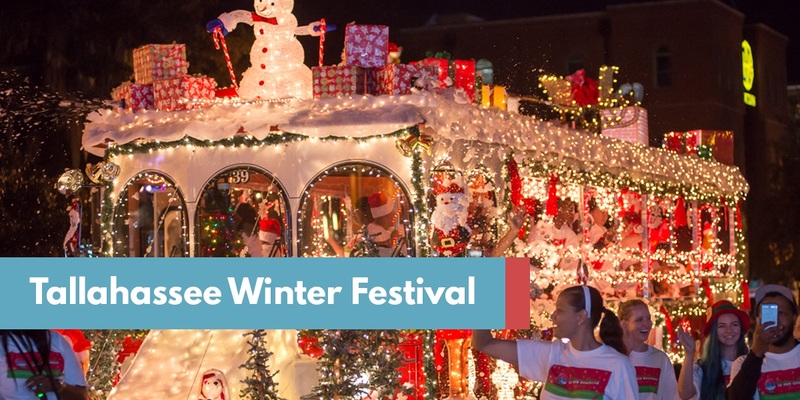 Tallahassee, Fla. — For the past 31 years, our state capital has kicked off the holiday season with the Tallahassee Winter Festival. Although it started as a small tree lighting ceremony outside City Hall, the event has become one of the largest festivals in the southeast. Now, every year Tallahassee’s McCarty Park is transformed into a Candy Cane Lane. Floats are endowed with Christmas lights for a nighttime parade. The Lighting Ceremony in Bloxham Park kicks off a Jingle Bell Run where runners take a nearly 2-mile hike dressed in Christmas garb. But turning Downtown Tallahassee into a winter wonderland is no small feat. “We’ll begin planning next year’s festival as soon as this year ends,” said Edwards. Although the Parks & Recreation Department heads up the event, everyone from police and fire to utilities and solid waste play a part. The Tallahassee Winter Festival kicked off 2017’s holiday season on Nov. 30th. West Palm Beach, Fla. — Floridians who dream of a white Christmas are bound for disappointment. That is, unless their dream involves white, sandy beaches. 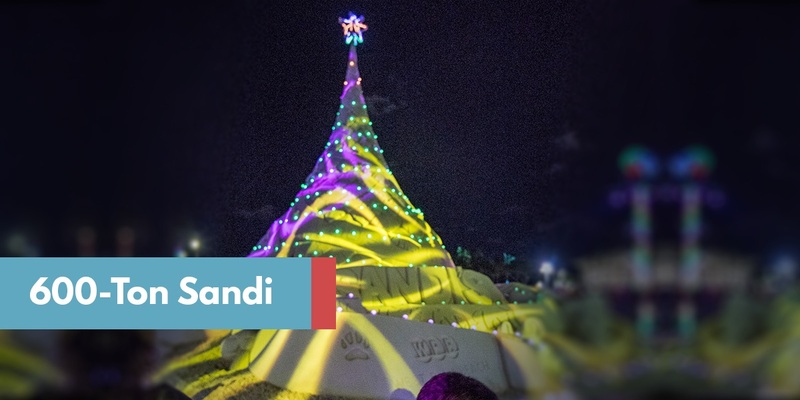 Sculpted from 600-tons of sand, the City of West Palm Beach’s one-of-a-kind tree—nicknamed Sandi—stands at 35 feet and has received national media attention from “The Ellen DeGeneres Show” and the Huffington Post. The tree is sculpted by Team Sandtastic, a world-renowned sand sculpting company from Southwest Florida. In 2010, the city began celebrating the holidays South-Florida style with 10 sand sculptures. But in 2011, Mary Pinak of the City’s Parks and Recreation Department, came up with the idea to create one giant sand tree instead. Now in her sixth year, Sandi has taken on a life of her own—just like Frosty the Snowman or the Nutcracker Prince. “Every year Sandi’s story – and her sassy personality – unwrap a little bit more and this year has surely been one of the most fun,” said Pinak. This year, people were mesmerized by Sandi’s mystery “love,” which turned out to be a Great Dane mix named Duke. Affectionately referred to as “a Great Dane for a Great Dame,” the “Duke of Sandi Land” made his debut as a 50-ton, 15-foot sand sculpture. Sandi, and her Duke of Sandi Land, are on display in West Palm Beach until Dec. 31st. Fort Myers, Fla. — Turns out, dreaming of a white, sandy Christmas puts you in very good company. 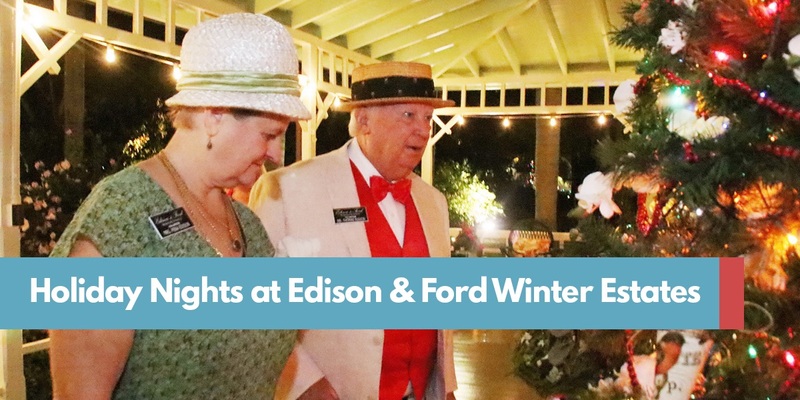 Thomas Edison and Henry Ford used to take their winter vacations together in Fort Myers. Their Winter Estates are kept up to this day along with a 42-year-old Christmas tradition. Visitors may view the lights from 5:30 – 9 p.m. nightly till Dec. 31st.